Sleep deprivation can disturb the endocrine regulation of energy homeostasis leading to weight gain and obesity. 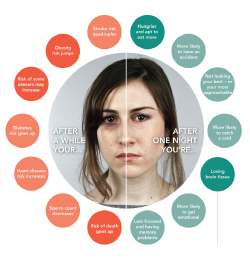 Sleep deprivation even for a single night can result in decrease in the circulating leptin levels and to increase ghrelin levels which then results in increased feeling of hunger. This, in the long run may result in weight gain and obesity. There are certain practices called “Sleep Hygiene” which should be followed by all to improve the quality of sleep. Avoid Alcohol, Tea, coffee or any other caffeine/nicotine containing product at least 4-6 hours before bedtime. Avoid heavy exercises for at least 2 hours before sleeping, although a light stroll after may actually improve the sleep quality. Avoid a heavy meal at dinner time. Warm glass of milk usually helps sleep better. A warm water shower can be very relaxing. Computer & TV should not be used in the bedroom. The atmosphere inside the bedroom should be calm and serene. Phones especially mobile phones should be kept in the sleeping mode at night. Lie down in bed only when feeling sleepy. Maintain regular sleeping hours – Wake up and sleep at the same time daily. 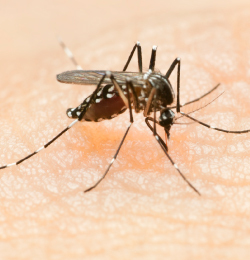 Dengue is caused after the bite of a specific type of mosquito which preferentially attacks during the day. Often a rash which may appear as fever reduces. Dangerous complications that can occur are hemorrhagic or shock syndrome. No specific treatment – no curative drug is available. Take complete rest Drink plenty of fluids orally Use paracetamol only Do not use aspirin (salicyclic acid), ibuprofen or nimesulide to bring down fever. Closely WATCH for bleeding from any site. 1. if fever is high grade and not settling. 2. persisting vomiting or severe abdominal pain. 3. immense lethargy or restlessness. 4. or if any of the following signs appear. • Blood spots under the skin (petechiae). • Peptic ulcer, haemolitic anemias and others. • Effective Mosquito Control by not allowing water to stagnate anywhere around. • Wear full sleeve clothes. • Use of Mosquito repellant creams when outdoors during daytime. • Get Flywire/screening fixed on doors and windows. • Use insecticides regularly especially in the morning hours – behind & underneath the furniture, curtains etc.